Measurements: 3.2 x 4.15 inches, or 80 x 105 mm. Wide. Back of card: An astrological horoscope, printed in white on a navy blue sky. Instead of pie slices, there are two circles that contain 12 smaller circles, one for each "house". In the very center, white "suns". May be inverted. Booklet included: Yes, 34 pages, 2.95 x 4 inches, or 75 x 100 mm. Publisher: US Games. The booklet is printed in the US, the cards are printed in Belgium. Comments: This deck looks distinctly under-produced to my eyes. The authors say this is a modern deck that preserves the underlying astrological, numerological, esoteric & color symbolisms of the tarot. If that's what you want from a deck, this will do fine. The pip cards of the four suits differ only in color. Each suit has its symbol (Batons: 8 petal yellow flowers, Swords: White spheres, Cups: Starfish, Coins: Maple leaves) & its color (see above), but cards 1 - 10 are otherwise identical, suit to suit. This continues with the court cards. All the Queens (for example) are identical, only the color changes. Court cards are Princess, Prince, Queen & King. 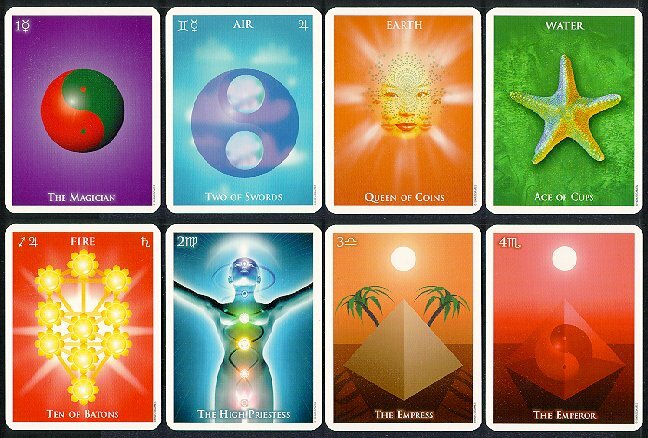 The major arcana shows by far the most variety, though as you can see above, the selection of images seems to bear slight relationship to the card in question, or why I chose to show cards 1 - 4, above. Various cards repeat a motif from a previous card (Strength & Hanged Man; Sun & Judgement), other cards are just plain strange: A Tree of Life for a Chariot, an orange disk on a black field for the Hermit, a shining star cross for the Fool. Perhaps not under-produced, perhaps, like the Korean language, highly stylized.